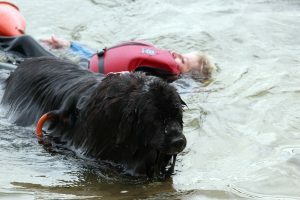 Newfound Friends is an organisation that uses Newfoundland dogs to raise money for charity. From May to September throughout the South West, people of all abilities, can take a jump overboard from a boat and be rescued by these magniﬁcent animals. All you have to do, is choose one of their charities and raise a bit of money in the process. “Last summer, at the South Cerney Outdoor Centre, I chose to leap for Hearing Dogs for Deaf People. ‘Drowning’ for charity, seems like a good idea when you are months away from the event, but when the actual day dawned, I was absolutely terriﬁed. Nevertheless, having raised hundreds of pounds for Hearing Dogs, I was determined to throw myself, literally, into the challenge. “Transferring from wheelchair to boat, my squeals could apparently be heard right across the lake. The dinghy bounced around like a discarded space hopper, but I eventually got my balance, only to sit straight on the accompanying diver’s foot. “Thankfully the diver had a sense of humour and the instant, jokey camaraderie, offered a distraction from thoughts of the ordeal ahead. “Soon it was time to meet my rescuer. 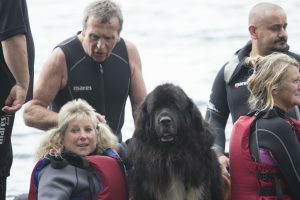 Watching a giant Newfoundland dog step assertively into the boat, I was in awe as she sat down beside me. Here was a girl with the kindest of eyes and who immediately seemed to sense all my nerves and reassured me with snuggles and kisses. Finally, we headed to the middle of the lake; the deep plunge was about to begin. “Positioning myself on the edge of the boat, my heart was pounding so hard I could barely breathe. Determined, never to let fear have the upper hand, I swallowed a gargantuan lump of it whole and allowed the divers to drag me straight in. “As I entered the water, I became completely disorientated and started spinning around like a dog chasing its tail. Once I was settled, Adam the diver had me lie on my back to practise the ‘rescue position’. Unfortunately, as I tilted backwards, my whole body dipped sideways and my face went under the water. Quickly righting me, Adam told me to relax and try again. The same thing happened, only this time I was face dunked to the right and came up a spluttering wreck. Hearing shouts of “Get her back to the boat”, I started to panic. Thankfully, the problem was small and once my lifejacket was readjusted, buoyancy was mine and I was able to swim back to my spot. 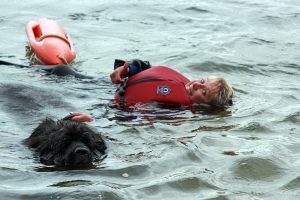 “Being a somewhat timid swimmer, I was quietly concerned about the tidal wave I assumed was about to be let loose, when Frankie the dog got into the water. Incredibly, it never came. Instead, this exquisite, furry giant, slipped into the lake with such grace that there was hardly a ripple. “So there I was, bobbing in the lake, with sunlit sparkles shimmering all around. It was an incredible feeling to see this powerful beauty swimming towards me. “Rescue, was the only thing on Frankie’s mind as she reached me. Moving straight into position, I grabbed the torpedo ﬂoat and before I knew it, we were busy making waves. “Steaming backwards through the lake felt awkward at ﬁrst, but it soon dawned on me that as long as I kept still, Frankie would do the legwork. With the water up to my ears, I was encased in a vacuum of muted, bubbling sounds. Happily accepting this weird situation, I simply held on tight. “Then came the ‘splashdown’. Immediately, we arrived at the water’s edge, Frankie let go of the rope. Obviously she knew her job was done, but I was all in a spin. Wildly ﬂapping in the water like a panicked duck, I had everyone in hysterics. Of course, had I trusted that Frankie would obviously leave me in safe, shallow waters, I would have realised that all I had to do, was sit up! Then, we got to do it all again. “Swimming back to the boat, I waited for Frankie to jump in once more. This time, I held the handle she carried on her back. With our bodies close as we sped along, I could feel her enthusiasm and energy as we powered through the water. The journey was rockier with the drag of the water slapping harshly at my body but as we cut through the water, I felt a deep and beautiful calm. “It was an extremely euphoric woman who eventually ﬂopped into the boat. Back on dry land, I was surprised to receive a round of applause and stupeﬁed to be asked to do an immediate piece to camera for local television. In my waterlogged state I spouted a fountain of emotional gobbledegook but my family assured me that I came across ﬁne. “Heading now for a much-needed cup of tea, I was stopped and embraced by a lovely lady who owns a hearing dog. Thanking me for jumping in and raising lots of money, we were both in tears as she explained how dramatically her own hearing dog had made a difference. 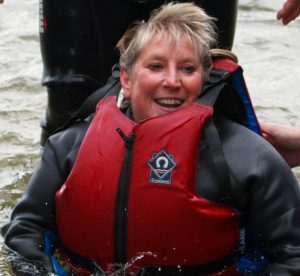 “I wasn’t the only person jumping that day; 29 other people took the deep plunge – and with all of you, I would like to share the lady’s words: “It takes courage to jump in at the deep end, but please know that with the money raised, a real gift of hope is given that will change people’s lives forever. Newfound Friends and Hearing Dogs for Deaf People help people to go beyond their boundaries and live the life they deserve. Both are run by dedicated and magnificent helpers, of the human and furry kind.